Worldwide, painting conservators have found that our "Museum Bars®" eliminate the need for restretching as art fabric relaxes over time. It's museum conservators and discerning fine artists who most appreciate the ability to gently expand or contract the stretcher bars equally in both directions, always keeping the painting square. To meet their needs, we put precision mechanical hardware in our Museum Bars® to allow infinite control and adjustment of every intersection. These expansion bolts control fabric tautness with unparalleled precision. Adjustable joints are located at all four corners of the stretcher bars and also where braces meet the outside stretcher bars. This means the stretcher bar positions can be infinitely refined to a maximum expansion of 3/8" per joint, or 3/4" per dimension. One of our most popular product lines, our Museum Bars® come in custom sizes from tiny to huge multi-piece installations. Larger sizes can be truck freighted or sent to you disassembled as a kit. We offer four profile thicknesses (depths) to allow for a variety of framing options in various applications. Our most popular, the E3 & E4 Wraparound Museum Bars® are designed for art fabric to be wrapped around the edges of the stretcher bars. This means the sides can be painted (gallery wrap), eliminating the need for framing. The design of the E3 and E4 bars is an interlocking t-section. This design makes an extremely rigid stretcher with three times the tensile strength and warp resistance. The front face of the "T" design has a beveled edge which raises your art fabric off the face of the stretcher bars. A recess in back of the stretcher makes it easy to tack art fabric edges, allows for tighter corners, allows space to inset a backing board, while still maintaining room for a hanging system. * Two copper-plated steel dowels in each joint. 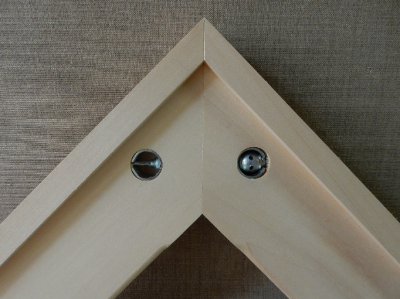 They keep each joint aligned, provide rigidity and prevent any chemical interactions with the metal or wood. * Extra width (over 3") that provides strength where stretcher bars need it most. 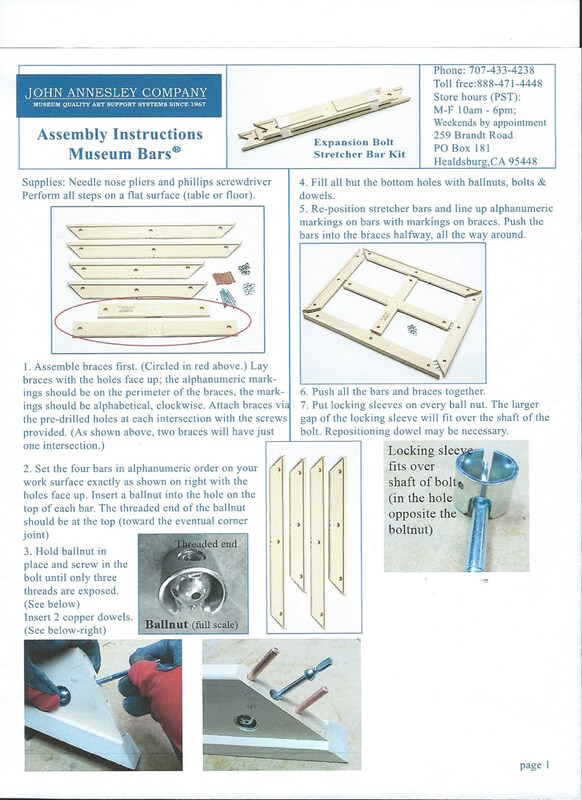 * Like all our stretcher bars, Museum Bars® are fabricated from knot-free, kiln-dried basswood, a very light weight and straight grain hardwood with an almost neutral PH. * Plus like all our stretcher bars, you have the option of shellac sealing the bars and braces. This barrier prevents any interaction between the natural resins of the wood against the art fabric. I have been a professional painter for more than thirty-five years. 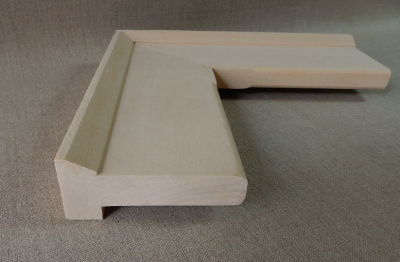 During that time I have used canvas stretcher bars manufactured by many reputable companies. I must tell you, however, that your Museum Bars are, by far, the best that I have found, and I use them for every major painting. Thank you for your practical innovation and excellent craftsmanship. I heartily recommend them to every serious artist who desires the best that is available on the market today. My sincere best wishes to you and your firm. 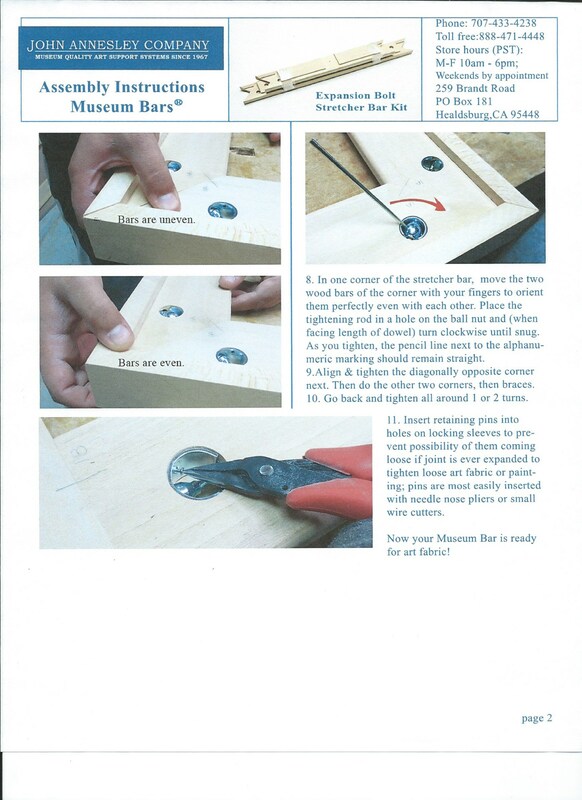 You can order our stretchers in standard sizes below, or call us for custom sizes. Available assembled or in kit form at the same price. These include bracing where appropriate and are finely hand sanded and constructed individually to order. Our lead time is currently 4-6weeks. If you need something quicker call us- we can usually accommodate your timeline requirements.